I have worked extensively as a writer in the community, undertaking over twenty major residencies in a wide variety of locations, including Arts Council of G.B. Resident Dramatist with Welfare State International in Barrow-in-Furness (“Shipyard Tales” 1989-91), Poet-in-Residence for Cheshire Arts & Libraries (1992), Resident Writer for Cheshire’s Year of Culture (1993), Poet-in-Residence with the homeless for Notts County Council (1994), Resident Playwright with The Acting School, Manchester Metropolitan University (1994-5), Playwright Attached to Theatre Studies Dep’t Lancaster University (1992-95), Writer-in-Residence for Derbyshire Education Authority (2004-5), Arts Council Resident Playwright for The Palace Theatre Mansfield (2006-2008 & 2013-15 ). I was a writer-in-residence in prisons for 25 years, working in every category of male prison, female prisons and young offenders institutes (male and female) – these include H.M.Prison Stocken (1987-88) and H.M.Prison Grendon, a therapeutic prison (1999-2001). I was a member of the Arts Council steering group that established the Writers in Prisons Network. More recently, I have been First Story Writer-in-Residence at a variety of schools from 2010. My work as a resident writer has involved working with people from across a broad range of communities and involving all age groups. 2018: “If We, In The Midst Of Hell, Can Smile” – commission by Junction Arts to create an exhibition and book to commemorate the involvement of the Clay Cross community, Derbyshire, in The Great War. Book features original poems and dramatic monologues by Kevin Fegan in response to research material. Writer-in-Residence for First Story at Lincoln Priory Academy, producing an anthology of pupils’ creative writing, “Powered by Tea (and Coffee)”. 2017: “Played in Mansfield” with Mansfield Palace Theatre. Funded by First Art. Dramaturg working on a dozen short plays by local writers performed by an ensemble professional cast at various venues in and around Mansfield. 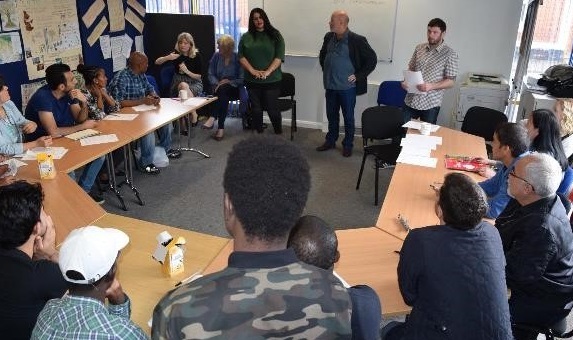 Sanctuary Derby – writer for Writing East Midlands with Derby Refugee and Asylum Centre to produce creative writing for an anthology, “Riding on Solomon’s Carpet”, by refugees and asylum-seekers from Derby, Leicester and Nottingham. Writer-in-Residence for First Story at St. Paul’s R.C. School Leicester, producing anthology “Around the World in Eighty Pages”. 2015: “The Big Welcome Cafe” – writer working on anthology by S.A.S. (Swadlincote Aspergers Society) commissioned by People Express. Writer-in-Residence for First Story at Nottingham University Samworth Academy, producing anthology, “Destination Imagination”. 2014: “Famous at Last” – creating a short film with the older generation of South Derbyshire. Commissioned by People Express, participatory arts organisation for South Derbyshire. Funded by Heritage Lottery. “Culture Club” – creating a poetry and images exhibition with the young G.B.L.T. community of South Derbyshire. Commissioned by People Express. 2013-15:Playwright-in-Residence for Writing East Midlands at Mansfield Palace Theatre. 2013-14: Writer-in-Residence for First Story at Queen Elisabeth’s Academy, Mansfield, producing two anthologies, “The Book of Requirements” and “Diversity and Unity”. 2013: “Shake the Dust” – regional Mentor for a national spoken word showcase at Nottingham Playhouse. Commissioned by Apples&Snakes and Renaissance, working with pupils from Bulwell Academy Nottingham. 2012-13: Writer-in-Residence at Bulwell Academy and Nottingham Academy for First Story, producing a book of creative writing by pupils, called “#trending”. 2012: “Away Pitch” – an Olympic Games Cultural commission with artist Vitor Azevedo, exploring the relationship between sports and arts. Commissioned by The Brewhouse, Burton-on-Trent, to produce a collection of poems and photos inspired by interviews with sports people who were asked to respond to living with works of art by regional artists in their homes. We created a touring exhibition of poems and photos and the collection was published by Artsmith. An Inspire Mark Award Winner. “Our Corby” – I was commissioned by Writing East Midlands to produce a scoping document in Corby, investigating the potential role of a Writer-in-Residence on an arts and heritage initiative, which led to securing of funds from both The Arts Council and The Heritage Lottery Fund for the project. I was subsequently commissioned by Corby Community Arts to work as a writer with the diverse communities of Corby, producing a collection of poems, “The Singing Tree”, as part of the publication “Our Corby”, produced with the Glassball artists from Derbyshire. 2011-2013 : Writer-in-Residence at Nottingham Academy for First Story, producing two books of creative writing by pupils, “Ellipses” and “Held at Ransom”. 2010: Shenton Primary School project for The Curve Leicester. “Story Surprise” project working as part of a teams of writers & designers with a director and performer, developing stories with children for a showcase performance at the school. “Visible” – arts project for the over 50’s at Newark Palace Theatre. Poetry tutor, leading to showcase reading at Newark Palace Theatre. 2009: “The Write Way Up” – mentor & artistic director of a showcase event for Leicestershire Museums, as part of the Lyric Lounge spoken word festival in Leicester. Seven poets were selected and commissioned to write a poem inspired by museum artefacts. “Tokens of Esteem” – compiler and editor of a poetry cd of six poets in Leicestershire who are mental health service users. Synergy Theatre project at Morton Hall Women’s Prison, Lincs. Playwriting workshops with women prisoners (non-nationals), developing scripts for Royal Court Theatre competition. Lead artist & creator of project creating 2 x 5mins original soap dramas written, performed and filmed by children from Ormsgill Primary School, Barrow-in-Furness. Produced by Art Gene. Writer-in-Residence at H.M.P. Foston Hall Women’s Prison & The Toscana Unit for female prisoners age 15-18. 2008: “Fabulous”. Compiler/editor of a new living-history book to celebrate the women of South Derbyshire, working with graphic design company Rare. Commissioned and published by community arts organisation People Express, funded by Heritage Lottery. “Freedom Showcase” – mentor of ten selected poets from the East Midlands, commissioned to write a poem to commemorate the abolition of slavery for a showcase spoken word event at Phoenix Arts Theatre Leicester. 2006-2008: Arts Council of England Resident Playwright for Mansfield Palace Theatre – commissioned to write 4 new plays: a community theatre play, two youth theatre plays and a small-scale touring professional studio play. 2004-05: Writer-in-Residence for Derbyshire Education Authority, working in schools across the county, culminating in a showcase spoken word event at County Hall, Matlock. project in Shirebrook School in Derbyshire, commissioned by Junction Arts & Derbyshire Education Authority, performed at a showcase event at County Hall, Matlock. Writer of a short video film with young people for Junction Arts in Cresswell, Derbyshire. Inter-generational project. Commissioned radio play for Creative Minds elderly group, Eccleston, Lancs working with pupils from Southhall Community School in Chorley. Director/deviser of a video diary film for The Lowry Galleries Salford. With families of supporters of Manchester United and Manchester City, inspired by Lowry’s original painting. I have edited over a dozen anthologies of work by other writers around the U.K., often as part of my work as a writer-in-residence. I have also worked extensively as a Dramaturg, mentoring emerging playwrights, for several companies, including North West Playwrights and the National Youth Theatre. I was co-organiser of a national poetry venue, Stand & Deliver, for 10 years in Tameside, Manchester and co-editor of “Zip” magazine which ran alongside the venue in the 1980’s, both funded by North West Arts. I was co-judge of the national Lancaster Literature Festival poetry competition (and co-editor of the anthology) in 1991. I have specific experience of teaching scriptwriting to both undergraduate and post-graduate students, both as a tutor and as a resident playwright. In1998-99 I was scriptwriting tutor for the Art, Media and Photography Department at Manchester Metropolitan University. In 1994-95 I was Resident Playwright at The Acting School Manchester Metropolitan University where I taught playwriting and devised shows with undergraduate actors in vocational training. For 3 years (1991, 92 and 95) I was Playwright Attached to the Theatre Studies Department at Lancaster University, where I taught playwriting and created the syllabuses for both undergraduate and post-graduate courses. I have set up my own companies in theatre (Big Theatre), film (Lonesome Trail Productions) and literature (The Amazing Colossal Press), which has involved me in employing artists, fundraising and grant applications and managing projects with budgets up to £80,000. I have also been an elected Director of the Board for Manchester City of Drama ’94 and for North West Playwrights and I have been Chair of East Midlands Arts Literature Panel. I was a member of the Arts Council of G.B. steering group who established the Writers in Prison Network in the early 1990’s. I have also organised two national campaigns for the successful release of miscarriage of justice cases, Paul Blackburn and Anthony Alexandrowicz.